For as long as I can remember I’ve dreamed of destinations and packing for trips. I was probably 4 or 5, but remember hiding in the back of my parent’s station wagon pretending I was in Hawaii when we picked up the babysitter. My best childhood memories were of trips we took in the US and the Caribbean. Watching my parents skillfully navigate a variety of travel situations provided me with tools I didn’t appreciate at the time; my father talking his family of 4 onto a plane in a packed San Juan airport on New Years Day when East Coast travel was ceased for days due to snow. Or, watching my luggage-less mother make flawless arrangements after arriving in Germany with a group of Girl Scouts to find all included meals had been re-budgeted to cover a last minute change in airline. One of my proudest moments was having to add pages to a 2 year old passport. As of October 2018 I have visited 59 countries, many of them repeatedly. 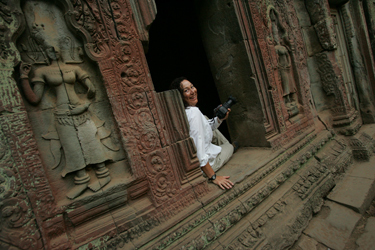 As a mid-aged woman who made my first solo international trip at the age of 15, I have a lifetime of travel expertise gained from navigating the world. You can benefit from what I’ve learned – and the mistakes I’ve made. In March 2015 I followed my passion and became a full time Travel Specialist. Transitioning from selling high priced advertising programs to developing dream vacations utilizes many of the same skills: dedicated customer service which includes being available; in-depth product knowledge; attention to detail; rapid response; and problem solving. There is nothing I would rather do than travel and plan amazing trips you will remember forever. This site is owned and operated by Grodberg Media LLC.